Evidently my gibbled knee is not yet working at 100% even though I can now take the stairs like a normal person. 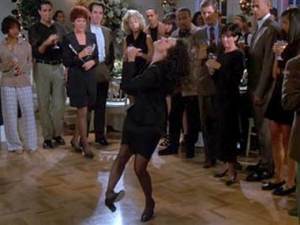 But I realized this afternoon while dancing in the kitchen that I was channeling my inner Elaine Benes more than should ever be done in polite company. Day two of crazy wind around these parts. The roof was blown off a school in Nanton today and there are sem-trailer trucks lying on their sides all over the highways. Sinuses are exploding all over the province. Off to PechaKucha tonight at the Central Library. Reclaim is the theme tonight. I'll fill you in on that and on Any Night, the play I saw at Sage Theatre last night. Sorry to hear your knee is still acting up. Hope is heals soon. The wind has been crazy here, eves came off the museum. Wind has been nuts here today as well. It's slowly getting stronger, Al, things just take longer these days. Grrr. I didn't realize you were getting crazy wind too! Hopefully the damage to the museum is minimal. Is the entire continent under a wind warning, Leazwell? That's disturbing! For now, just blame the wind and do have fun at PechaKucha! hompa- That little dance one does when trying to squeeze into your leiderhosen. I challenge you to a dance-off, Sean! It'll be truly awe-inspiring, hopefully not heave-inspiring. PechaKucha was good. Perhaps not the most inspiring one I have been to, but certainly the most packed. Record breaking attendance. I totally missed the wind storm here, and Allison and I live in the same town! I knew we had a weather warning re. wind but I didn't think it ever amounted to much. Then I see Allison's comment and I'm like, "I missed it!" Wow. How lucky are you to have missed the wind, WC? Speaking as someone who hates the wind with a fire stronger than a million suns, I would say pretty darn lucky. Haha, yes. I will perfect my best Elaine moves, Al, and challenge all 2012 Communiqueters to a throwdown. Two dancer enter, one dancer leave.